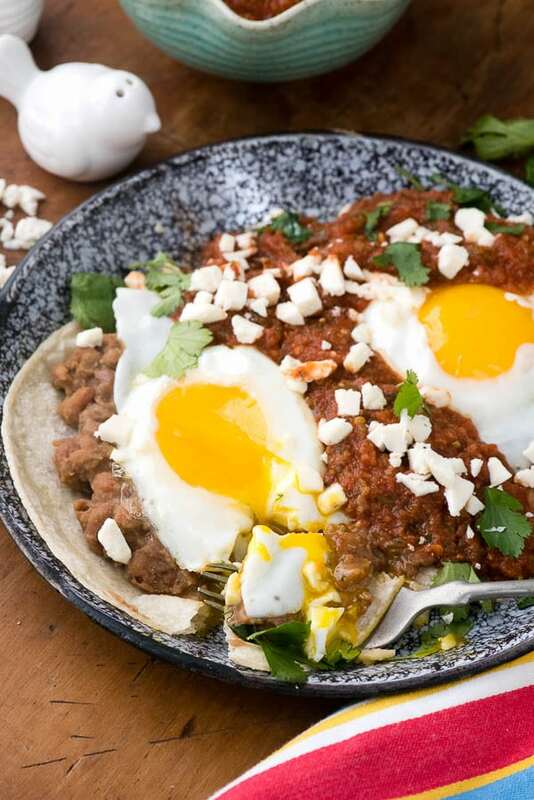 This Huevos Rancheros recipe is an authentic hearty Mexican breakfast anyone will love. 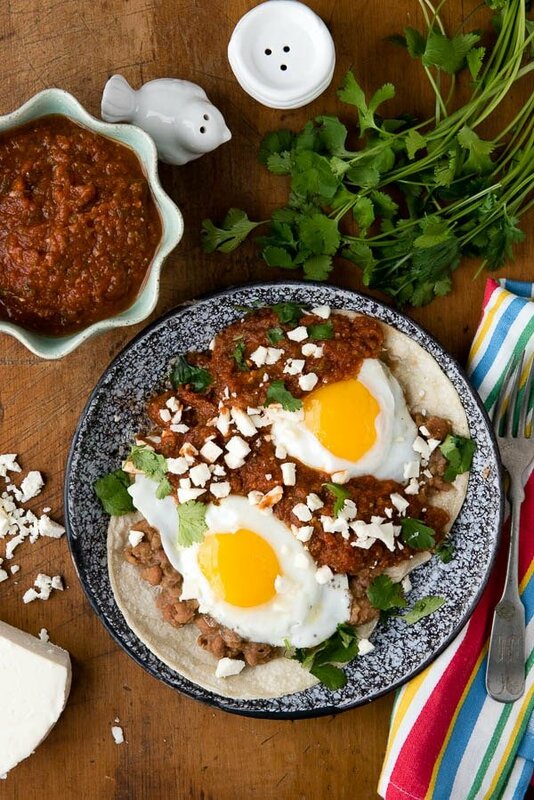 Starting the day with a layered breakfast of corn tortillas, eggs, homemade refried beans and spicy salsa is a perfect fuel up. Last month I hopped down to Santa Fe, New Mexico for a few days, which definitely is one of my all-time favorite food towns. I’ve been averaging a trip a year for the past few years, and find there are definitely far more authentic Mexican recipes to devour than my stomach can manage in one trip. One thing I’m always reminded of when there is how much I love a spicy, savory breakfast. I’ve never been a big carb eater for breakfast, much more preferring protein. Add some sultry, spicy sauce and I’m all in. I’m sharing my latest post-trip craving for authentic Mexican Huevos Rancheros today! Another great thing about the Southwestern-meets-Mexican food breakfasts is that they are usually naturally gluten-free. Chilaquiles are another favorite authentic Mexican recipe, made with corn tortillas, scrambled eggs, chicken, homemade chile sauce, avocados and fresh toppings like tomatoes, cilantro, queso fresco and sour cream. Are you hungry for an authentic Mexican recipe yet?! 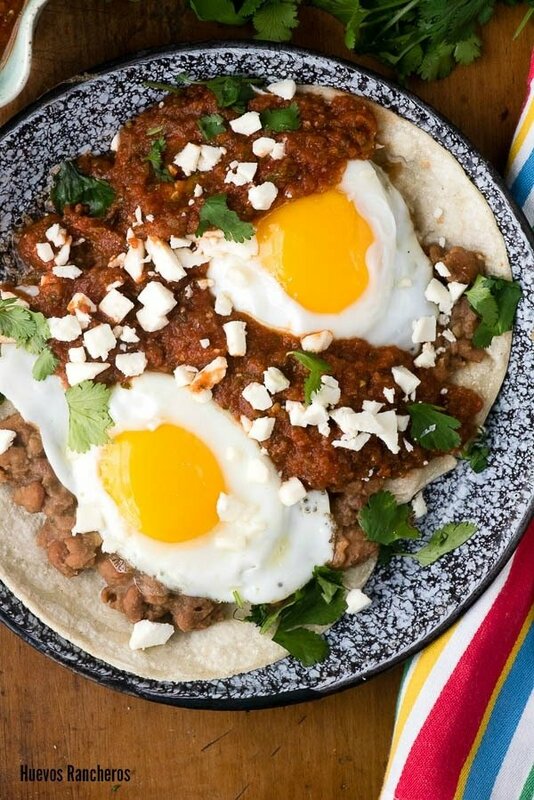 Huevos Rancheros are similarly irresistible, with lightly fried corn tortillas, topped with homemade refried beans (‘quick-style’ in my version), homemade spicy salsa, fried eggs (or scrambled if you prefer), cilantro and queso fresco. The mere appearance makes my mouth water! It’s such a satisfying dish, especially with a big cup of coffee. Fuels you up for a full day of fun. Something I love about this authentic Mexican recipe is how quick the components are to prepare; and they each could be used for different recipes too. The refried beans are made using canned pinto beans which speeds up the process. I also have a little twist I use that might sound weird but you need to trust me on this. Instead of cooking the beans with water, I use a mixture of prepared coffee and water. Hold on, hold on, don’t close the page! The coffee serves to deepen the flavor of the beans and does not leave them tasting like coffee. Honest. You have to try it. The spicy sauce is also easily prepared thanks to the food processor. If you are gluten free, one thing to look out for when traveling in the Southwest or having authentic Mexican food is whether the red or green chile sauce has flour in it. It usually does. That can really put a damper on the full experience of a dish. This sauce is thickened slightly by frying it, which also deepens the flavor. 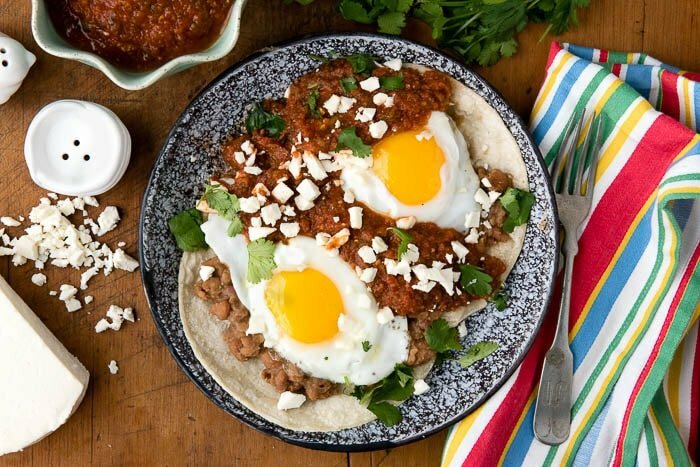 Huevos Rancheros is a hearty breakfast pretty much anyone could love. 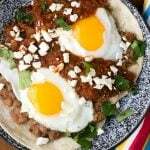 Starting the day with a layered breakfast of corn tortillas, eggs, homemade refried beans and spicy salsa is a perfect fuel up. In a food processor, combine tomatoes, onion, cilantro, garlic, and jalapeño. Process until pureed. In a medium saucepan, warm the 2 teaspoons of canola oil over medium-high heat. When the oil appears to ripple add the salsa. Stir constantly for 3-5 minutes, allowing the salsa to thicken slightly. Pour the salsa into a bowl, salt if needed, and return the pan to the burner without cleaning it. Add the beans, water, coffee, adobo sauce, cumin, and garlic to the salsa pan and cook over medium heat, stirring constantly and smashing the beans (note: I find using a wooden cooking spoon works well for this). Cook for 3-4 minutes until the liquid begins to incorporate into the mixture, thickening the beans. Remove from heat and allow to sit (beans will continue to thicken). Salt if needed. In a small skillet, add 1/2 teaspoon of the remaining canola oil and heat over medium-high heat. Add a tortilla and allow it to warm for about 30 seconds, flip and warm on the opposite side for 30 seconds. Remove from the pan and place on an individual serving plate. Repeat, using more oil as needed, until four of the tortillas are each on serving plates. Continue warming the remaining four tortillas in the same manner and set aside. In a large skillet, fry the eggs or scramble them (your choice). Divide the refried beans evenly (about 1/4 cup per serving) and spread a serving on each tortilla on the serving plates. Top with an egg (careful not to break the yolk if fried eggs), a serving of salsa (note: there will be more salsa then needed for each serving), cilantro leaves and a sprinkle of queso fresco. Fold each of the remaining four warmed tortillas and add one to each plate for sopping up the dish. 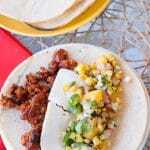 This Huevos Rancheros recipe is a contribution to Food Fanatic in my role as as the Naturally Gluten-Free Fanatic. I need to try this. 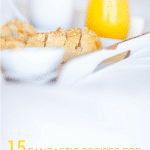 I’ve been looking for new recipes to try, this looks delicious. We have a local Mexican restaurant that serves this. I have been iffy to try it, but next time we go I’m planning on trying it out. It looks delicious. I hope you’ll love it! It’s such a hearty, homey meal I think. Interesting note about the flour. This recipe looks good, I bet it tastes great! Super Delish! 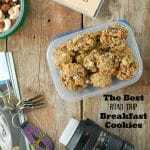 An authenic Latino breakfast dish I would love to recreate! I grew up with this being a standard for breakfast. I haven’t had it in years. What a delicious breakfast. Lucky you! It was cereal in my house. This looks so delicious! I love a good, hearty savoury breakfast – definitely saving this one for later! Now these look amazing! We usually do breakfast for dinner once a week and I think this would be the perfect recipe to add to our lineup! This looks like an amazing meal. I want some! 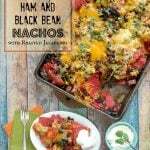 I love a good southwestern dish! This looks really yummy! I will have to try to make it, never had anything like it before.